Monster Park Grand Opening in Les Diablerets 3000! MONSTER PARK GRAND OPENING Saturday, November 25th, will mark the beginning of a new development for Royal Ski Candy and others. Located in the Swiss Alps, the first major competition to take place on the Glacier Diablerets 3000 since its new owners will be an open and invite slopestyle jam session. Male and female riders from several different nations will compete against each other for a first prize of $1,000 in each category. Invited competitors are Mick Deschenaux, the Demonium Crew, Henrik Harlaut, Blayze Bramwell, Anders Murud, Adam Falk, Virginie Faivre, Ian Cosco and Witt Foster. Royal Ski Candy girls competing are Trine Dahlberg (our youngest team member who shows much potential), MC Waryas, Helen Nadig, Nastasia Bach and Franca Frautschi. Registration starts at 8:30 and an entry fee of $60 will apply. Skiers and snowboarders are welcome. And don’t forget to attend the after party, during which Cali P will perform. So if you’re in the area, drop by, ride, or watch, and listen to some live reggae. This event would not be possible without the Demonium Crew, a special thanks is in order. We’d also like to thank Hansel&amp;Gretel; Newschoolers.com; Max, our webmaster; all of the girls from Royal Ski Candy; Kari Traa Clothing; Zazi Underwear, and MC Waryas. The jam session will run annually from this year onward. 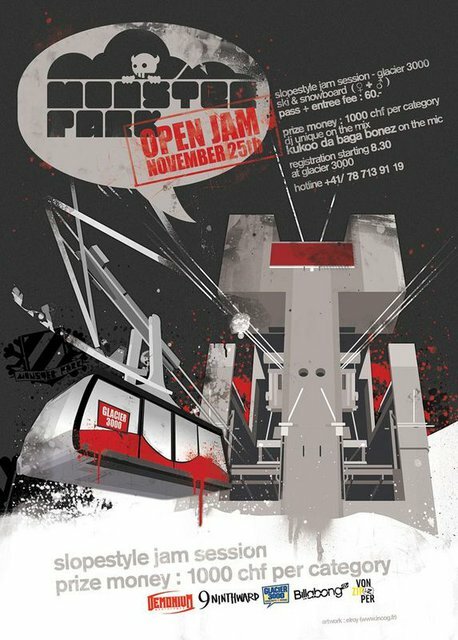 For inquiries about the competition or Royal Ski Candy, email crew@royalskicandy.com, or visit http://www.monsterpark.ch.